It’s that time of year again! The sixth annual IBU Challenge, our largest inter-club home-brew competition, is upon us. For this year’s competition we are excited to once again announce that Iron Goat Brewing Co. will be sponsoring the event – and their brewing staff will be selecting on of the top 5 finalist beers to brew at Iron Goat as a Pro-Am beer! We are also very happy to announce a new sponsor for this year’s competition: Imperial Yeast! Imperial is partnering with IBU and Iron Goat for this competition to provide every registered competitor with yeast for their competition beer. Which brings us to this year’s theme. For this year’s challenge, competitors can brew any style of beer they desire – the recipe is completely up to you… except for one ingredient: yeast. 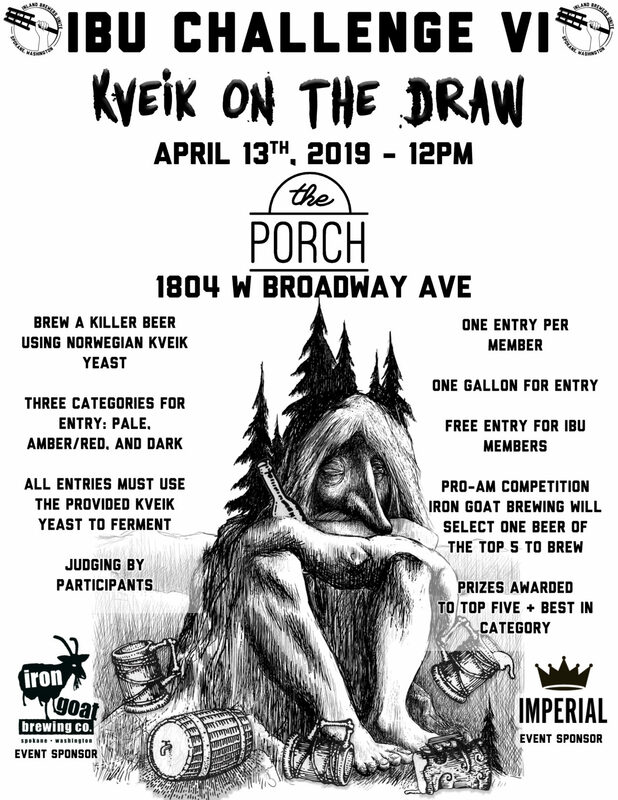 Imperial Yeast will be providing each competitor with a special Kveik Yeast blend, and each competition beer must ferment their beer with that yeast. And if you’re wondering “What the hell is kveik yeast?” – don’t worry! At the IBU Challenge VI Registration Event, we’ll be providing all the competitors with information on the history and origins of kveik yeast along with some lab notes from Imperial on the specific blend they have provided. So be sure to attend the registration event to receive your yeast and information. Please see the official competition rules below for submission details and award information. We look forward to seeing you at IBU Challenge VI! You’ll be provided with a single pack of the Kveik blend yeast to use for fermentation. The processes in which you pitch or grow up your yeast culture is entirely up to you. All other aspects of the beer recipe are completely open – but remember, our pro-brewery sponsors and those judging your beer will be looking for a brew that stands out and presents the kveik yeast as a key component to the beer! One Gallon of beer required for entry. Please submit the beer in 32oz “grunts” or bottles (750ml, 22oz, 12oz, etc.) for easy pouring. Runners Up: Recognition for 5th Place through 2nd Place in overall competition score. Our sponsor brewery, Iron Goat Brewing, will be selecting their favorite beer among the top 5 scoring beers to be brewed at their brewery with the homebrewer in Summer 2019. Entry is free for all current dues paying members. Non-members may participate in the tasting/judging for a fee of $10, which provides a 30-day membership to IBU. Inland Brewers Unite (IBU) is a 501(c)(7) social club. Our members are a diverse group of dedicated beer geeks who enjoy the craft and hobby of making beer. The club aims to educate our members about the world of craft beer and home-brewing while also connecting them with the local and regional beer industry. Copyright by Inland Brewers Unite. All rights reserved.